Keeping a home well insulated during winter is vital to ensure comfort, cost saving and also to help reduce overall carbon emissions. However, few realise that an insulated garage can be as important as a well insulated house. 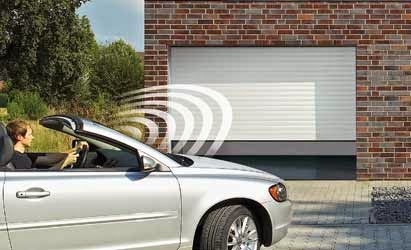 This is especially the case for integral garages when there is a connecting door between the garage and the home; or when warmth is required in the garage because it is used for storage or other activities. Garador now offers a range of insulation options to ensure housebuilders and homeowners can find the very best garage door for every property. For instance, on their popular sectional doors, Garador offer a Premium insulated option which ensures the highest levels of thermal insulation and structural rigidity. Each 42 mm thick double-skin steel section is evenly filled with 100% CFC-free PU rigid foam with a seal between each section. Garador also offer sturdy rubber weather seals on all sides of the door to help keep the elements out. On the Garador GaraRoll door, the aluminium profiles are filled with a CFC free polyurethane foam to provide good thermal insulation and enhance energy savings. Garador is conscious of environmental impact and this not only covers the development of insulation for their garage doors but also their manufacturing processes. At their UK factory, the company has implemented a dedicated recycling scheme, where all metals, plastics, paints and packing materials are recycled or reused wherever possible. They have also installed an intelligent energy management system which helps to reduce energy consumption saving many tonnes of CO2 emissions each year. Find out more about Garador’s full range of garage doors at www.garador.co.uk or call 01935 443701. Have you read our latest issue yet?